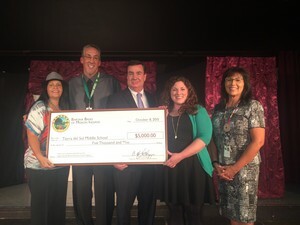 SAN DIEGO, CA--(Marketwired - Oct 8, 2015) - Students and faculty at Tierra del Sol Middle School in Lakeside were happy to accept a $5,000 Barona Education Grant today from the Barona Band of Mission Indians. The middle school immerses sixth graders in an innovative learning community that focuses on science, technology, engineering, arts and mathematics (STEAM). California State Senator Joel Anderson was on-hand to award Principal Scott Goergens with the grant, which will be used to purchase a projector, sound system and other technology that will update the school's Fine Arts Department. "The arts are just as important as other subjects in school, which is why we've chosen Tierra del Sol to receive this grant so that they may better develop their Fine Arts Department," said Clifford LaChappa, chairman of the Barona Band of Mission Indians. "Our grant program is meant to give educators the opportunity to provide their students with the best tools to succeed and we hope we've helped give them a leg up with these much needed and deserved funds." Since 2006, the Barona Band of Mission Indians has awarded over $2.5 million to 494 schools statewide to help bridge school budget gaps and share resources through its Barona Education Grant Program. The program is the first of its kind in California created and administered by a Tribal Government. The goal of the program is to create strong educational opportunities for the children of California building upon the success of the Barona Indian Charter School, which operates under a continuous improvement model. Schools throughout California can apply for educational grants from Barona to purchase much needed supplies and materials that promote academic improvement. Each grant awarded by the Barona Education Grant Program is $5,000. Applications can be downloaded at http://barona-nsn.gov/education. The Barona Band of Mission Indians, recognized by the United States government as a sovereign nation, has lived on the Barona Indian Reservation in rural eastern San Diego County since 1932. Prior to that, the Tribe lived on the Capitan Grande Reservation which was established by the federal government in 1875. Long before living on a reservation, the Tribe traveled across Southern California in tune with the seasons and what nature provided. Today, the sovereign nation, governed by an elected Tribal Council, is serving its Tribal members, their families, and sharing with the San Diego region. One of the most successful gaming Tribes in the country, Barona also owns and operates the Barona Resort & Casino, San Diego's leading gaming resort, casino and golf course. For more information, visit www.barona-nsn.gov.